No Longer feel paralysed by fear and panic. Feel confident and stay calm even in stressful situations. Know that you look composed and confident. You can Learn to soothe your nervous system and reverse the adrenalin rush. Overcome anxiety the safe and natural way! When a person first has a panic attack the symptoms can seem very like a heart attack. Symptoms include such things as shortness of breath, tight chest, rapid heartbeats, sweating, dizziness, disorientation, shaking and trembling, and so forth. It is the fear of having a panic attack in advance that keeps causing them. If you suffer from panic attacks then you will know this only too well. Think of a future situation where typically you would have suffered from a panic attack and notice what begins to happen in your mind. Dr Jan’s “Stop Panic Attacks With Hypnosis” recording will train your mind to do something else rather than anticipate the fear. 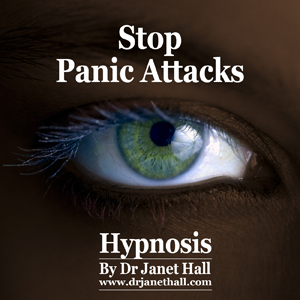 When you listen to Dr Janet Hall’s recording, “Stop Panic Attacks”, your subconscious mind will be reprogrammed with positive influence: influence that will safely and naturally enable you to overcome anxiety, with minimal effort on your part. All you do is listen and absorb the subconscious suggestions from the recording, and the problem will begin to dissolve. At the onset of a panic attack, your mind signals to your body to react physically to some sort of perceived threat. Hypnosis can allow you to take back control by helping you to recognise and regulate your response. With the help of hypnotherapy you can feel more at ease on a daily basis and have a better understanding of the impact stress and anxiety has on your body. So, if you’re serious about wanting to stop having anxiety and panic attacks then you need to get a copy of “Stop Panic Attacks With Hypnosis” right now! This is one of a series of hypnosis audios presented by Dr Janet Hall called: “How To Get Sensational Results With Dr Janet Hall’s Hypnosis”.